Painting the busy Rockport harbour is hard enough on a still day but today I was fighting the wind. My right hand held the brush and my left was on the painting, but that’s what makes plein air painting so thrilling. You never know when the whole easel will topple or the painting will fly into the water. There’s lots more painting to come this week but wanted to post the first one along with a link to the terrific website The Other Cape. 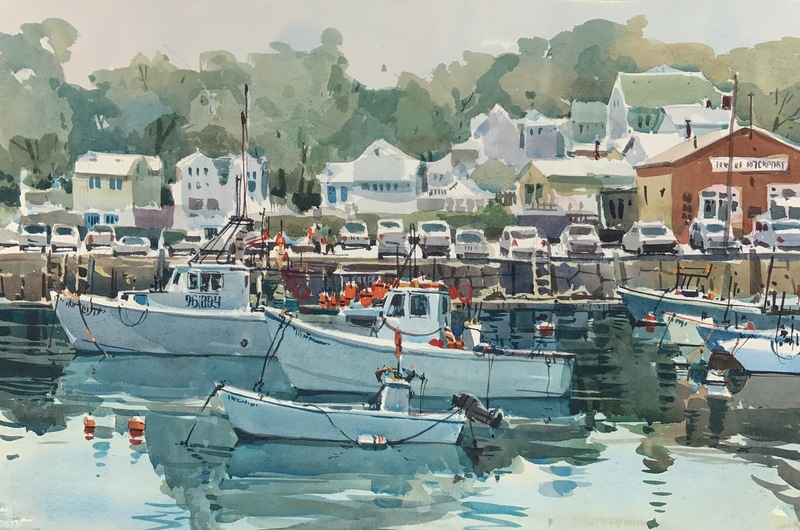 I am honoured to have been interviewed by Patrick Mitchell about why I love to paint in Cape Ann. Very timely article Patrick! Thanks so much. Stunning; such fine subtleties and detail. Great article Shari. A pleasure to read and look at. Your love of the place comes through in all those beautiful paintings. Hope you and Spyro have a great break. My love affair with Cape Ann continued all week. We did have a great break although I didn’t post anything for the whole week. I had a triple whammy of a back injury, a tooth in need of a root canal and couple of bug bites that turned my face into a swollen mess. It didn’t stop me from painting or having a good time though, although I did have to hide behind sunglasses for a bit. But I will be scanning my work and posting it this week. Hope you and Mo are well. Really enjoyed the article about Camp May and the chance to see more of you fantastic artwork. Thanks so much Donna. I didn’t end up posting anything while I was there because I worked on larger paintings, but I will be posting them this week. Absolutely a fantastic painting. You really captured the mood. Congrats on the article, very nice. Keep those wonderful paintings coming. Thanks so much Martha. I painted all week and will be scanning and posting them now that I’m home. Gorgeous paintings and wonderful interview! I followed the link to Edgar Whitney’s tribute website and was delighted to find out that Elliot O’Hara had influenced his style. Years ago I took a watercolor portraiture workshop with Phoebe Flory (Mount Vernon) who had taught with Mr. O’Hara and later on passed on his techniques in her own school. Fascinating to see these great teachings kept alive through several generations of artists! So glad you researched the history of some of the great teachers of watercolour in North America. It is a wonderful experience to read about them all. I have so many watercolour books by many of the greats. Sometimes I just spend a few hours perusing them. Oh, how I LOVE this painting. There is no indication that it was painted though difficult winds when your arms struggled to hold on to the board and brush. It is sooooo well done. Magnificent. Such a wonderful gift you have! I appreciate all your share in visuals and in the telling of the many events surrounding each work. Your blogs are a joy to read and candy for my eyes. Thanks for all that Bernadette. I am back home in Montreal now and scanning the rest of my paintings. I will be posting them all week long. You really know how to capture the essence of the place. I love your paintings. I love how you’ve continued to “discover” the surroundings of Rockport. Your paintings are beautiful and I love studying them. Thanks for sharing! Thanks Dottie. When I’m in Rockport I discover new places and go back to old ones too. I love painting the same places again and again. Each year I see something new in the old locations too. What an atmospheric painting – a portal to a different time and place. I love it! Hi Joyce, This is Rockport Mass. I’m in awe, Shari. So very detailed, but still ” loose” This is gorgeous. I so enjoy seeing your Rockport paintings, Shari. Returning each year to a beloved place with never-ending scenes to paint is such a pleasure. The article/interview was fun to read, too. Thanks Barbara. I am just back and scanning all my work. I’ll be posting it all week. Once again, we had great weather and there were too many places I wanted to paint. Couldn’t get to them all but I tried hard! I read the story of your work by Patrick Mitchell. Your paintings are just gorgeous. I almost cried reading about your feelings of the coast because the Maine Coast is a great love of mine.This collection of your work is just amazing. Would love another book. So glad you read the article Judy. I should do a book of my Cape Ann paintings! Great idea. A project for next year. What a nice interview article. Fun to read. Spent several summers in Pigeon Cover very near Rockport and fell in love with the area. Masterly handling of materials. Romantic subject matter. A real winner! I have painted in Pigeon Cove too. What a great spot. I didn’t make it there this year but I love that place. Many thanks for writing Daniel! Loved the article! Plein air painting can be a challenge…but I agree that is what makes it so interesting. Great job on the harbor and all the buildings beyond the parked cars on the wharf. This is lovely! Is this Maine? thanks Laura. This is Rockport, Mass.